And then the game started. Luol Deng was called for a third foul late in the first quarter and Jimmy Butler a third foul with just about two minutes gone in the second quarter. That’s right, get in there and guard the reigning MVP LeBron James on the night he received his second championship ring in his home arena in your first game as an NBA player. If Jimmy Butler cannot play Sunday afternoon in Miami, Tony Snell likely will start as he started the second half against the Nuggets with Mike Dunleavy starting at small forward. Who did this kid upset? It wasn’t exactly how Snell dreamed about his first NBA game. As soon as Snell entered, James got a rebound of a Kirk Hinrich miss and threw a long pass to Dwyane Wade for a layup and three-point play, the Heat’s four-point lead a few minutes ago now up to 14. It was James then with a driving reverse layup and foul. Snell missed a three. Carlos Boozer got the rebound. Snell with another miss on a three. James then ran out for a finger roll layup. Ray Allen hit a three and then James was fouled, making both, the Miami lead now 47-26. Snell then got a steal on an Allen pass, but immediately gave it back with a turnover, the half soon to end with Miami leading 54-33 and Snell’s night done effectively along with the Bulls’. Snell played 6:44 in that second quarter shooting zero for three with two fouls, a steal and a turnover and no points. He didn’t play again that game and not for the next two games. In the next 10 games, he played a total of eight minutes. And Snell Sunday may get the chance to show how far he’s come when the Bulls visit Miami for the first time since that opening night blowout loss. Jimmy Butler remains a game-time decision with a bruised rib suffered early in the Denver game. Though X-rays were negative, it would seem unlikely he’d play the way he had to leave the court doubled over in pain. If Butler cannot play, Snell likely will start as he started the second half against the Nuggets with Mike Dunleavy starting at small forward. The Bulls got some revenge with a 107-87 win over Miami back in December. But Deng still was with the team. He usually played James. Butler took over after Deng. Dunleavy is not a good matchup for James. So it likely would be Snell. And it’s a good time for Snell coming off his career best game with 20 points on seven of 14 shooting with three of four three pointers against the Nuggets. It was one of the best Bulls offensive performances of the season as they come into Miami the hottest team in the league with five straight wins to raise their record to 29-25. The Pacers and Heat are at the top of the Eastern Conference. But the Bulls and Toronto are beginning to gain some traction in the third and fourth spots. James is coming off a broken nose in Thursday’s Miami win in Oklahoma City as the Heat had a strong Western Conference trip. Miami has only one more loss than Indiana for the top record in the conference. James is listed as day-to-day as well, though indications are he will play. If he does, Snell likely will get the defensive assignment if Butler remains out. But the Bulls don’t have so many bodies anymore. If Butler cannot play, Gibson probably will have to defend James some. Plus, the Bulls do not double team much, especially against Miami with so many three point shooters. It could be a busy afternoon for Snell. It’s been a slow, if typical rookie season for Snell as a Bull. Rookies don’t tend to play much with Thibodeau until there are injuries. Snell is averaging 5.6 points on 38.9 percent shooting for the season. His biggest month was December when he averaged 6.3 points in 25 minutes per game. But three of those games were six minutes or fewer as his playing time has come mostly in emergencies. It makes it difficult to develop consistency. So it’s not surprising he’s played tentative at times and was overlooked for the All-Star rookie/sophomore game. Some games he’ll come in and look for his shot. Others he’ll stand around and pass up wide open shots with defenders dropping off. He’s actually one of the better three point shooters on the team with a nice arcing shot. And lately he’s begun to take the shot. “Coach told me when I’m open to shoot the ball,” said Snell. Snell is quiet and shy. He speaks in short sentences, but is unusual as he is strong with eye contact at whoever asks question. He obviously had media training and remembers that as he practically stares through the questioner. But he’s always cooperative and approachable and has a quick smile. The lanky 6-7 small forward wasn’t a star prospect at New Mexico, averaging 9.2 points over three seasons. But he’s long with good basketball skills. He admits the transition to the NBA was difficult and somewhat intimidating, though he says his teammates have been supportive and positive. He’s acknowledged being uncertain, though he’s always enthusiastic and the first one jumping up on the bench to celebrate the rare Bulls three pointers that are coming more frequently of late. 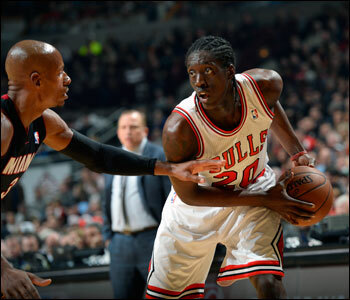 With Deng traded, Butler has moved into the role of the player Thibodeau is least likely to take out. But now it may have to be Snell, and he feels he’s ready. “I’m being more patient,” Snell says. “I used to always rush. Now read what’s going on in the game. I’m learning watching on the bench. When my opportunity comes up, I’m going in and trying to do my best. He may get his chance on the big national TV stage again Sunday. He’s not going to be quite so in awe this time.